27-year-old Holly Starr has had an emphatic and remarkable entrance into the CCM industry, over the past few years- she was ‘found’ by songwriter Brandon Bee via her Myspace videos; and since that time, has never looked back! A small-town country girl at heart, this talented guitar playing singer-songwriter from Quincy, has released 5 albums so far (Human in 2017, Everything I Need in 2015, Focus in 2012, 2011’s Tapestry, and 2008’s Embraced); with plenty of radio singles and inspirational hits that have all gained significant radio airplay and positive responses. With Holly having mastered almost every musical style, from pop to piano ballads to straight up worship; it’s clear that there hasn’t really been much more that Holly is yet to cover. Until now that is. “Talk It Out” isn’t a Christian song, but rather it’s a positive ‘mainstream’ song that reminds us of the more important things in life. This track is something brand new from Holly, as this ‘left field project’ only enhances her writing style and relevance, as she sings about current and everyday issues. With lyrical material that has inspired me and challenged me in my walk with God and my own relationships with those around me; “Talk It Out” will no doubt change lives in the hearts of many who listen. Musically EDM at its core, Holly puts to the fore the notion of a couple having communication breakdown and issues with their marriage- and is an honest prayer from both sides as they ‘talk it out’, either by themselves or with a counsellor or with family and friends. It’s not known whether the outcome is a happy or a sad ending, yet Holly’s point remains. That we should as people fight for those whom we deem the most important in our lives. If there is a disagreement, we should forgive and listen to the person’s story. If we can’t agree, maybe the best course of motion would be to agree to disagree. Yet at all times we should be quick to listen and slow to judge and speak. And as Holly reiterates that ‘…I’ve made mistakes and you’ve made mistakes, you hurt my pride and I hurt yours, it’s gonna take a whole lot more to tear us apart, yeah, I’ll do my part, no matter what, whatever it takes…’, we are met with a track that may feel uncomfortable for some but needed for all. 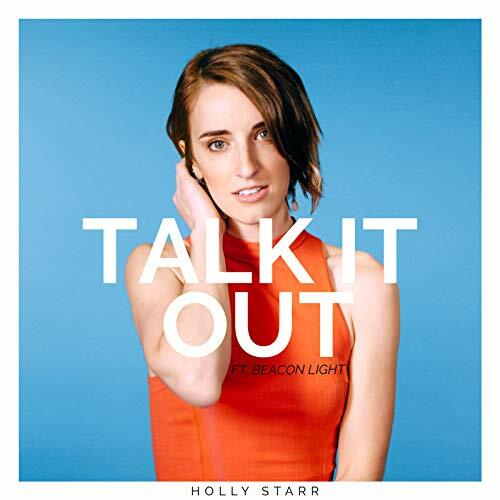 Holly Starr’s new song, along with Focus, Everything I Need and Human previously, is a breath of fresh air in a music industry still heavily focused on male singers and bands. Tackling heavy issues in a light-hearted and pop-infused manner, we are met with song that probably won’t be played on the radio stations like K-Love or even Air1 (maybe because of the lack of the word ‘Jesus’ present in the track! ), however “Talk It Out” is definitely one of the most out-of-the-box and different song I’ve heard in a long time. A certain purchase if you love artists like Nichole Nordeman, Lindsay McCaul and Bethany Dillon; “Talk It Out” is a must listen to, as we try to actively ensure that our relationships stay intact and there’s no need to talk anything out.